Yoko is going to school for the first time and though she is keen to make new friends and to try out new things, she does not want her mother to leave her in Mrs. Jenkins' class. When her mother tries to leave, the little cat cries so hard that her mother agrees to stay. The next day Yoko still does not want her mother to leave, though she does let her go to the cafeteria to get a drink. On Wednesday Yoko's mother is able to leave Yoko for a little longer to run an errand, but Yoko is still not ready for her mother to go home. Then Timothy, Yoko's new friend, tells Yoko that "mothers always come back" and Yoko discovers that he is absolutely right. In this splendid book Rosemary Wells explores school life. She tells six stories in all, each of which highlights an important "golden rule" of the classroom. If children observe these golden rules their classroom will be a happier place for everyone. The first golden rule, as we have seen, is that "mothers always come back." The second one is that one should respect and not laugh at people who do things differently. After all, "many geniuses are thought to be crazy because they are different." In the third story twin brothers learn that "teasing hurts like hitting," and in the fourth tale readers can see that whispering can be both "hurtful and unkind." The fifth golden rule is that not everyone can be in the limelight all the time; one has to take turns. And in the final story readers will see that some people have hidden talents which they don't share with others until the time is right. 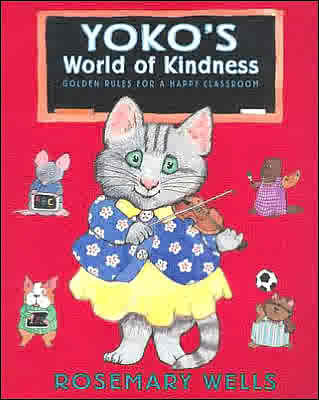 Every kindergarten and first grade classroom should have a copy of this book on their shelves so that children can learn, with the help of Yoko and her friends, what is and what is not acceptable behavior in their new environment. Rosemary Wells' six stories are easy to follow, sympathetic, and not at all preachy. Instead, readers will learn by example what the six rules mean and why they are important. Teachers and parents will be able to use the stories to open up discussions about good behavior, kindness, and friendship. With its wonderful illustrations and meaningful stories, this is a picture book that will surely stand the test of time.